"Here is the question: where, in fact, will we get this money?" Putin pondered. International institutions such as the World Bank have long pressed Russia to reform its pension system, but the Kremlin resisted, despite constant warnings by fiscal hawks that it poses an unbearable burden on the budget. 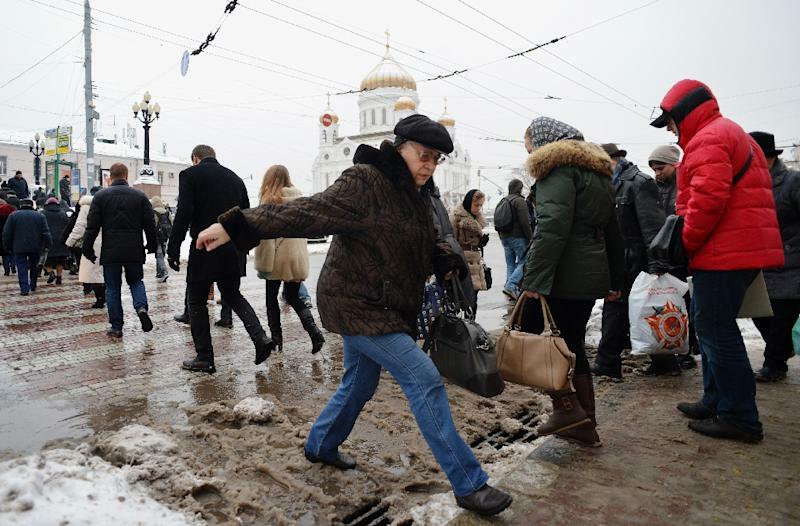 The recession adds to the problem of an ageing population combined with fewer Russians entering the workforce due to a slump in births in the 1990s, and has prompted the government to sound the alarm. "The faster we resolve this issue, the better for the economy and for the budget," Finance Minister Anton Siluanov said recently, proposing to hike the retirement age to 65 for both men and women. Economy Minister Alexei Ulyukayev last week backed raising the retirement age gradually, by six months per year. "From the point of view of the economy, they should have raised it a long time ago," said Igor Nikolayev, director of the FBK Grant Thornton Institute of Strategic Analysis. "The reserve fund is being quickly depleted," he said, referring to a rainy-day fund the Russian government has filled with $75.7 billion earned from oil and gas sales in recent years. "Next year they may exhaust it completely." Raising the retirement age now, however, could cause severe discontent ahead of parliamentary polls next year and presidential elections in 2018. The government "would not take such an unpopular decision before the elections, especially as the crisis is still unfolding" and real wages have declined by 10 percent, Nikolayev said. Steadily increasing pensions were a vital campaign issue for Putin ahead of his return to the Kremlin in the 2012 election and remain at the core of his social welfare package. Moscow regularly stresses that preserving social stability is a top priority. "Nobody should doubt that however difficult the situation, we will pay salaries and increase pensions," Prime Minister Dmitry Medvedev said last week. A poll by the independent Levada Center found last month that 79 percent of men and 81 percent of women are against the pension age rise. Most people still view the prospect of such a hike "with hostility," said Levada Centre sociologist Stepan Goncharov. Russian women are particularly huffed as they often retire early to help raise grandchildren. "The government is now trying to gauge the public mood and understand how strong the protests will be," he told AFP. In an apparent attempt to sway public opinion, lawmakers have proposed raising their own retirement age to 65. "It's a very touchy subject," Medvedev said. "The decision should be a result of calm discussion with the public, taking into account all points of view." Goncharov said the decision could have a strong impact on Putin's rating, but much depends on "how the issue is presented" by the government and the opposition. He expects the government may attempt to channel the public anger "into anti-American sentiment". The government may succeed in convincing people that "Russia is suffering due to sanctions, not because we are following bad policies," said Goncharov.